When you are one of the world’s most well-known contemporary artists, trying to figure out how to incorporate living plants into an 8-foot-tall mirror-polished, stainless steel sculpture of Venus, who you gonna call? Cornell, apparently. Neil Mattson and Chris Wien were the lucky horticulturists who fielded the fateful phone call from Jeff Koons’s staff last year, and it has led to an interesting collaboration that has benefited both art and science. 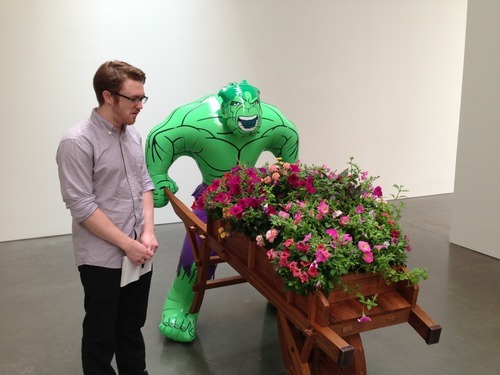 Koons, a New York City-based artist known for his larger-than-life sculptural depictions of everyday objects such as 14-foot balloon animals, was seeking advice about which flowers to select and how to care for them in sub-optimal indoor gallery conditions for the duration of exhibits that often last several weeks.